I’m sitting on the bench, in a small park. I wear an ill-fitting white suit and hold a single flower in my hand. Glancing nervously, side to side, I look down at my feet. I’ve been waiting so long for this. Out of the corner of my eye, I see you appear. I look up slowly, to savor the moment. You look stunning, in all blue. You must have bought the outfit especially for today, you must have. “Hello.” I manage to stutter out. I remember the flower and I hold it out to you, averting my eyes. You take it, and smile. 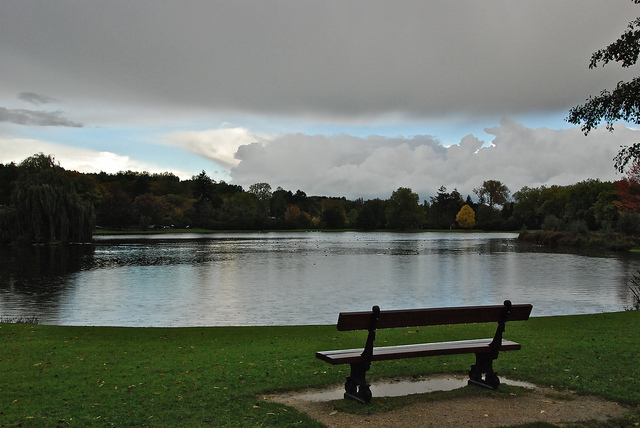 Together we sit on the bench, and just watch the lake across the grass for a few minutes, surrounded in silence. I reach next to me on the ground, but nothing is there. I had forgotten the picnic. Embarrassed, I tell you this. You life a hand to my flushed red cheeks and look me in the eye. Your gentle smile says everything, and I know I’m forgiven. Your soft hand trails down my face, my neck, my arm, until it reaches my hand. I grab yours, and we form a single being, combined through spirit. We read each other’s minds, and at the same time, leap up and run. We never let go of each other. Soon, I become aware of my lungs, working hard to keep me alive. I ignore their cries, and keep running with you. Eventually, it becomes too much of a burden for both of us, and we stop. We collapse onto the ground laughing, breathing heavily. You lie back in the grass, and sigh, smiling up at the sky. I look up as well, and the blue reflects in my eyes. Soon, I too recline on the ground. We spot clouds shaped like animals and faces, we guess the exact shade of blue in the sky, we pick grass. It’s nice. I feel happy, for the first time in a while, and I know you do too. Your phone is out, lying on the grass between us. Music pours from its speakers, seeming so insignificant under the vast sky. “Wish You Were Here” by Pink Floyd softly plays while we roar with laughter over a cloud. “Norwegian Wood” by the Beatles is the soundtrack that fills the space between our words. Every second is magical, and I wonder if in 100 years, the world will remember us. Will the grass still have our indent? Will the clouds we made fun of still float up in the sky? Will the flower I gave you remain delicate and alive? Yes, I decide. The world will always have a memory of today. When the universe ends and a highlight reel is played on an old rundown projector for no one to watch, this day will be there. And when we kiss, the universe will cheer, clap, whistle, and cry. It will leave, knowing that we are together, and shed a tear when it bursts into flame, moved by what we have. I roll over on my side and tell you all this, as seriously as I can be now. You laugh, and ask why I think about the future, instead of experiencing universes favorite moments firsthand. “Because… I…” I can’t finish the rest. You silence me with a kiss, and we look back up at the sky, this time with no words. When I look your way, you are smiling that little fragile smile you always seem to have plastered to your face. I grin. Eventually, you close your eyes, but I don’t dare look away. I know this won’t last for much longer, and I need to savor it. You’re just so beautiful; I wouldn’t dear to tear my eyes away for even a second. I blink, and it all happens. My shoulder is grabbed by a firm hand, and I’m yanked upwards. Quickly, your eyes open, and are instantly filled with fear. All you can do is watch as I’m pulled backwards away from you. I scream your name. You watch me. I turn to the hand. It belongs to a man in glasses. I kick backwards, aiming for his knee. I miss, but I try again. I yell your name like a battle cry, trying and trying to free myself from this man. He just pulls out a taser. I feel a massive jolt through my body, and immediately fall over. It takes so long for the pain to go away. I pant your name. The man just chuckle. “It’s not real,” he repeats. “We need to get you back to your room now; you’ve had enough time in the sun today.” I look back at you, and you smile, waving your hand, shooing me off. You know it will be ok. I don’t. With one last call of your name, I turn back around to face the hospital. The man tightens the straps on my straightjacket, and leads me to the while building. I have next week, I tell myself. The universe will always remember us, but no one else will. Sarah Alden is a sophomore at Clayton A. Bouton High School.